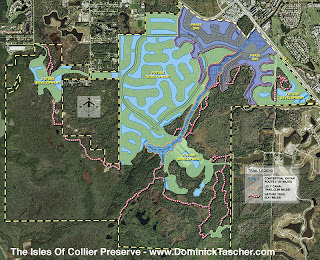 The Isles Of Collier Preserve. Naples, Florida. An interesting eco-friendly new community is under development in Naples, close to downtown Naples and Fifth Avenue S.
Minto Group has started the ground breaking and constructions of the infrastructures. The Isles of Collier Preserve will be developed on 2,300 acres with 1,600 acres of lakes and waterways where residents will be able to kayaking among nature preserve areas and wildlife. Coach homes, attached villas and single-family homes will be offered, starting in the $400s. Olde-Forida style is considered for the style of the homes. The community will offer miles of trails, biking paths and a clubhouse with a resort-style swimming-pool and spa.